In printing, a stereotype, also known as a cliché, stereoplate or simply a stereo, was originally a "solid plate of type metal, cast from a papier-mâché or plaster mould (called a flong) taken from the surface of a forme of type" used for printing instead of the original. The composition of individual cast metal types into lines with leading and furniture, tightly locked into a forme, was labor-intensive and costly. 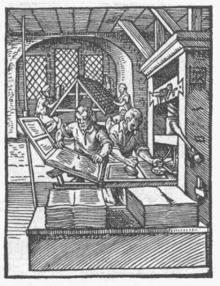 The printer would incur further expense through loss of the type for other uses while held in formes, and the wear to the type during printing. Publishers who did not accurately predict sales were forced into the expense of paying for the type to be reset for subsequent editions. The stereotype radically changed the way books, especially novels, magazine articles and other popular forms of literature, were reprinted, saving printers the expense of resetting while freeing the type for other jobs. ...while Nathaniel Hawthorne's publishers assumed that The Scarlet Letter (1850) would do well, printing an uncharacteristically large edition of 2,500 copies, popular demand for Hawthorne's controversial "Custom House" introduction outstripped supply, prompting Ticknor & Fields to reset the type and to reprint another 2,500 copies within two months of the first publication. Still unaware that they had an incipient classic on their hands, Ticknor & Fields neglected at this time to invest in stereotype plates, and thus were forced to pay to reset the type for a third time just four months later when they finally stereotyped the book. English sources often describe the process as having been invented in 1725 by William Ged, who apparently stereotyped plates for the Bible at Cambridge University before abandoning the business. However, Count Canstein had been publishing stereotyped Bibles in Germany since 1712 and an earlier form of stereotyping from flong was described in Germany in 1702. It is even possible that the process was used as early as the fifteenth century by Johannes Gutenberg or his heirs for the Mainz Catholicon. Wide application of the technique, with improvements, is attributed to Charles Stanhope in the early 1800s. 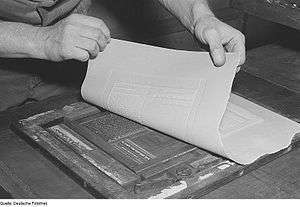 Printing plates for the Bible were stereotyped in the US in 1814. Over time, stereotype became a metaphor for any set of ideas repeated identically or with only minor changes. In fact, cliché and stereotype were both originally printers' words, and in their printing senses became synonymous. However, cliché originally had a slightly different meaning, being an onomatopoeic word for the sound that was made during the process of striking a block into molten type–metal during another form of stereotyping, later called in English "dabbing". The term stereotype derives from Greek στερεός (stereos) "solid, firm" and τύπος (tupos) "blow, impression, engraved mark" and in its modern sense was coined in 1798. ↑ Logan, Peter Melville (2011). The Encyclopedia of the Novel. West Sussex, UK: Blackwell Publishing. p. 676. Retrieved May 11, 2011. ↑ Logan, Peter Melville (2011). The Encyclopedia of the Novel. West Sussex, UK: Blackwell Publishing. p. 677. Retrieved May 11, 2011. ↑ "William Ged, (b. 1690, Edinburgh, Scot.—d. Oct. 19, 1749, Leith, Midlothian), Scottish goldsmith who invented (1725) stereotyping". Encyclopædia Britannica. Retrieved 11 January 2011. ↑ Hatch, Harris B.; Stewart, Alexander A. 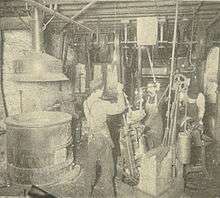 (1918). "History of Stereotyping". Electrotyping and stereotyping. Chicago: United Typothetae of America. pp. 45–49. Primer for apprentices in the printing industry. Alexis Weedon (2003). Victorian Publishing. Ashgate Publishing, Ltd. p. 16. ISBN 9780754635277.